Fables de la Fontaine is one of Constant’s bistros—he really has taken over the entire block—4 restaurants!!! This is his restaurant focusing on fish. It is a tiny place—only 12 tables. 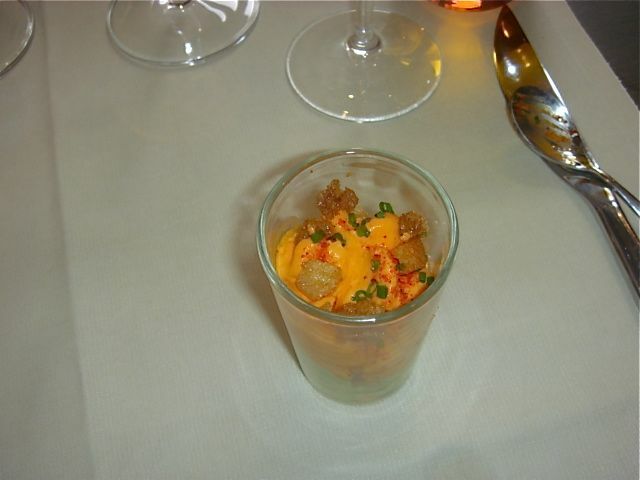 Amuse: mousse of crab with tiny 1/8” dice of tomato on the bottom, piquillo pepper, a layer of 1/8” dice of cucumber and topped with a bit of toasted small croutons—very nice. 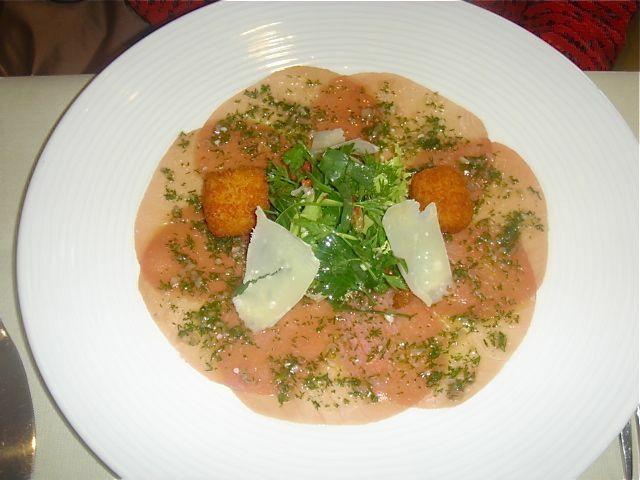 John: Tartare de gambas aux huitres, sable au parmesan. 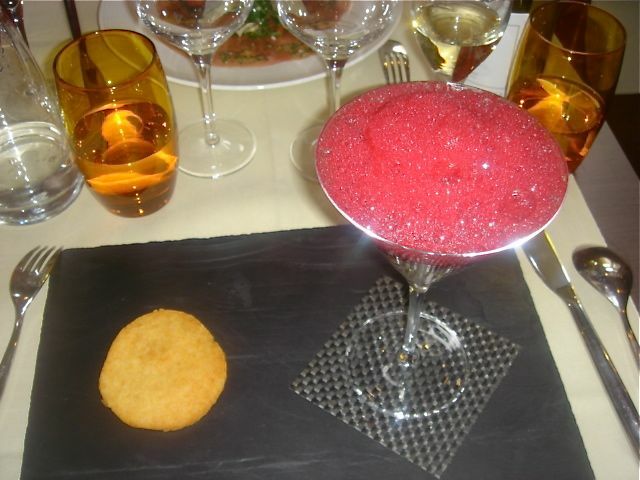 Tartar of shrimp and oysters with a parmesan cookie [not crisp, abut ¼” thick]. The tartar was delicious and the cookie added great flavor. Me: Croustillants de langoustines of basilic, vinaigrette d’ agrumes. This had a nod to Robuchon’s langoustine dish. 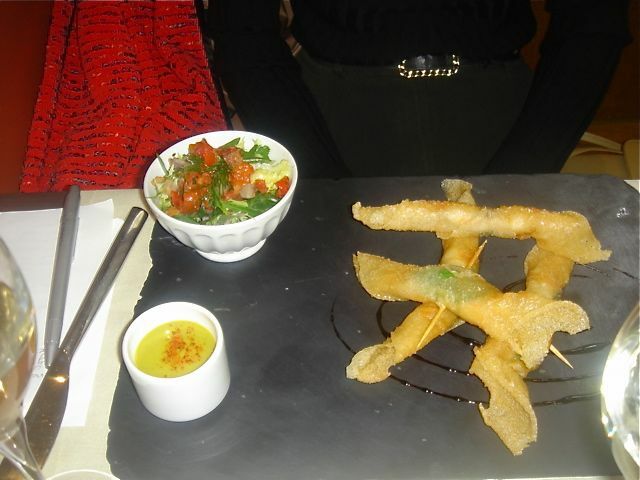 A langoustine wrapped in a [my guess] brik, deep fried, served with a citrus vinaigrette, basil and a small salad. Very good!! 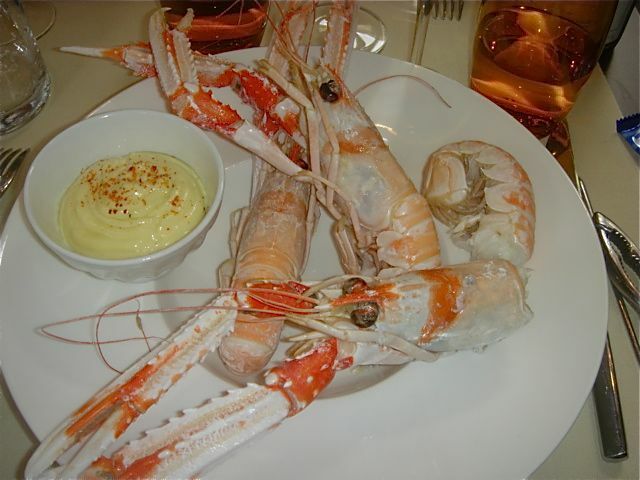 John: Langoustines, cuites a minute, mayonnaise. For those who don’t know it…John will not eat with his hands! So here we are in Paris and John is presented with three beautiful [according to me) fresh, whole langoustines just cooked in the shell, a shellfish cracker and a thin shellfish “fork”. There is no way to describe the look on John’s face. Of course, I was in hysterics knowing John’s feeling about eating with his hands. He did manage to get some meat out, but he left a lot of meat still in the shell. He said it was good, even great, and the mayonnaise sauce was so terrific that he used up the part that did not go on the fish on some fresh bread. Wine: 2006 Sancerre Le Chene, Lucien Crochet—perfect with the seafood. Light, but full flavored, clean and crisp. Fables de la Fontaine is an excellent fish bistro. Ingredients are pristine. It is small and cozy. Service is attentive. And it provided major comic relief for me at John’s expense.